Making sausage at home is a rewarding and interesting craft. In complexity it is somewhere between making bread and making beer or wine. The reward comes in the flavors that can't be matched by the industrial sausage found in the supermarket and the knowledge of being in control of every ingredient that goes into the sausage. Hard Salami, Summer Sausage, Liver Sausage, Braunschweiger and Breakfast Sausage. In the glass on the table are Beer Sticks. As there are many shortcuts to making sausage that are more like rolled up meat loaf, abundantly available elsewhere on the web, I will confine these pages to real sausage of the type you would find in a high quality deli. 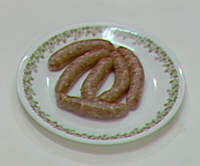 Fresh sausage is cooked just prior to serving. It will only keep a few days in the refrigerator but can be frozen for future use. Examples are: Polish, bratwurst, Italian and breakfast sausage. It is traditionally stuffed into casings but can be formed into patties and fried like hamburgers. It is made up of ground meat and spices. As the user controls both, the variations are endless. Implicit in the word cured is the use of an agent or process that provides long term keeping properties to the sausage. The use of salt, drying and fermentation are examples of curing that have been used for millenia. Modern public health practices demand the use of chemical agents in the form of nitrites and/or nitrates to assure the destruction of pathagenic organisms such as that which causes botulism. Sausages are made from ground meat. This can be purchased from a butcher already ground but the true sausage buff will sooner or later want his own meat grinder. These can be inexpensive hand cranked affairs found in most kitchen junk drawers or motor driven grinders running a wide range of prices. I use the inexpensive attachment sold for use with the Kitchen Aid mixer. All grinders operate on the same principal. An auger pushes the meat into a rotating blade that chops the meat as it forces it through the the stationary output plate. The size of the holes in the plate determine the coarseness of the ground meat. They range from 3/16" to 1/2" and the meat can be run through several times for a very fine grind. Real sausages are stuffed into casings and this requires a stuffer. Fortunately, this can be done with the same meat grinder by adding a stuffing tube. Casings are a whole world in themselves and I refer readers to the link below for more information. The choices are myriad and include natural animal parts, fiber and plastics. My favorites are sheep casings for breakfast sausage and brats, hog casings for Polish, fibrous casings for summer sausage and beef middles for salami. The choices are endless and only with experiecne can one decide what works best for him. There are many web pages devoted to the making of sausage and I have no intention of repeating what is better said elsewhere. I do feel however, that I have come up with a few recipes for my favorite sausages and developed a few procedures that are not commonly known or discussed elsewhere. I have listed a few links below for general information on the subject. The subject that seems to cause the most confusion to beginners is that of cures. They come in various forms and with various names but the bottom line is that one type contains sodium nitrite and the other contains sodium nitrite and sodium nitrate. The generic name for the former is Prague Powder #1 and the latter is #2. These go under various trade names but are always recognized by the Prague nomenclature. In addition to the bacteriacidal effects of cures, the most obvious effect of cures is the pink color of the finished product. Gray or brown ham, bacon and sausage simply does not appeal to the modern consumer. Morton Salt has several products that combine the cures with large amounts of salt and sugar that provide all the salt and sugar needed for a recipe but it precludes the sausage maker from experimenting with the amounts of the ingredients in a recipe. I much prefer to use the Prague powders and adjust the salt and sugar to my taste. These cures are inexpensive and readily available from the many sources of sausage making supplies found on the web. Fermentation is another subject that has been much maligned in the amateur literature. It is either ignored completely, declared too complicated for amateurs or quack substitutes such as "Fermento" are recommended. As mentioned above, fermentation adds a taste element that simply can not be duplicated any other way. Furthermore, the lactic acid produced by the fermentation provides the sausage with an additional weapon against spoilage. Cured sausage without this step is about analogous to beer without alcohol. 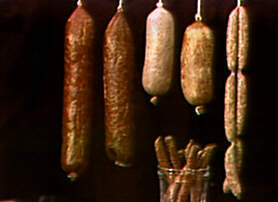 Prior to modern times, sausages where hung up to cure and with luck, the appropriate lactic acid producing bacteria would happen along and colonize the sausage and produce the needed fermentation. Unfortunately, as in winemaking, trusting to luck often produces unpleasant surprises. Contrary to the popular literature, the fermentation step is no more complicated than adding yeast to bread. In fact the culture is sold in foil packages just like yeast and stored in a freezer. It is inexpensive to begin with and only 1/8 tsp is required for a 5 pound batch. Because of all the misinformation, the biggest problem was finding a source for the culture and I spent several months experimenting with cheese cultures as a result. They worked fine but I eventually found a source for the proper sausage culture and it is also listed below. In use, the culture is mixed with a little water and sugar and then mixed in (along with the spices) with the meat mixture. After stuffing, the sausage is held at around 90F overnight for the fermentation to take place. This can be done in a smoker, oven with the light on or just take a little longer at room temperature. 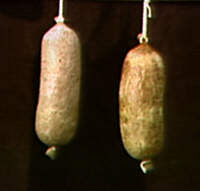 The sausage is then smoked, cooked or dried according to the recipe. There simply is no excuse for not fermenting if the type of sausage calls for it and that is just about all sausage except fresh. Smoking is an option with many sausages and a must for some. "Liquid smoke" provides a smoke flavor but can't come close to producing all the complex effects of real smoke. Smokers come in all shapes and sizes and are not difficult to make. There are many sources on the web for information on them so I will not discuss them other than to say that I use a "Little Chief" which I modified by installing the "Big Chief" heating element and adding an external temperature control (* see below) to it. I can ferment at 90F, smoke at 130F and cook at 160F which are the basic numbers needed for most sausage and ham. I can also Barbeque at 200F but that is another story. With that brief introduction, I will present my recipes as links to separate pages to save download time. recipes so be sure to start there even if you want to make a different sausage. This is also commonly known as pork sausage and the predominant flavor is derived from sage. They are traditionally stuffed into sheep casings but can also be formed into patties and fried like burgers or stored in bulk for poultry stuffing. This is the sausage of pizza and can be frozen in bulk or stuffed into hog casings for sandwichs. The predominant flavor is derived from fennel and the meat is pork. You may note this looks a lot like the breakfast sausage picture. Well, as the only difference is in the spices, it does not seem worth the effort or bandwidth to do a separate one for Italian. This sausage needs no introduction other than to say it is a fresh sausage that can be cooked and eaten as is or smoked and then cooked. This is a mild flavored sausage which when smoked is a gourmet's delight. In fact, that is the only way I prepare it. This is the sausage of Octoberfest. It is made from pork and veal and a long list of spices. In this country it is stuffed into hog casings but in parts of Germany and my favorite is the sheep casing size. These are cured sausages made from pork liver, pork hearts and pork. Braunschweiger is smoked after cooking hence the "braun" in the name. They are best stuffed into beef middles as fibrous casings do not shrink with the sausage. *Termperature control unit.... Ranco ETC available from Grainger cat # 3ZP77.